Iranian filmmaker Jafar Panahi "bravely defies his 20-year ban on filmmaking yet again" to bring us his latest film, titled Closed Curtain, a follow-up to his last creation, This Is Not a Film from 2011. This new film plays with another meta concept: In a secluded house by the sea with the curtains shut, a screenwriter hides from the world with only his dog as company. The tranquility is abruptly broken one night by the arrival of a young woman fleeing from the authorities. Refusing to leave, she takes refuge in the house. But come dawn, another unexpected presence will change everything… The cast includes Kambuzia Partovi, Maryam Moqadam and Jafar Panahi. I'm intrigued, there's something about this. Maybe it's that dog. A synopsis, but it may not help clear up anything: They are both on the run: the man with the dog he isn’t allowed to own because Islamic law deems it to be unclean, and the young woman who took part in an illicit party on the shores of the Caspian Sea. They barricade themselves into a secluded villa with curtained windows and eye each other suspiciously. Why has he shaved his head? How does she know he is being followed by the police? They are both prisoners in a house without a view in the midst of a hostile environment. The voices of police can be heard in the distance, but so too can the calming sound of the sea. One time they look at the night sky full of stars before again withdrawing behind their protective walls… An absurd situation: two characters from a screenplay, both searching for and observing their director. 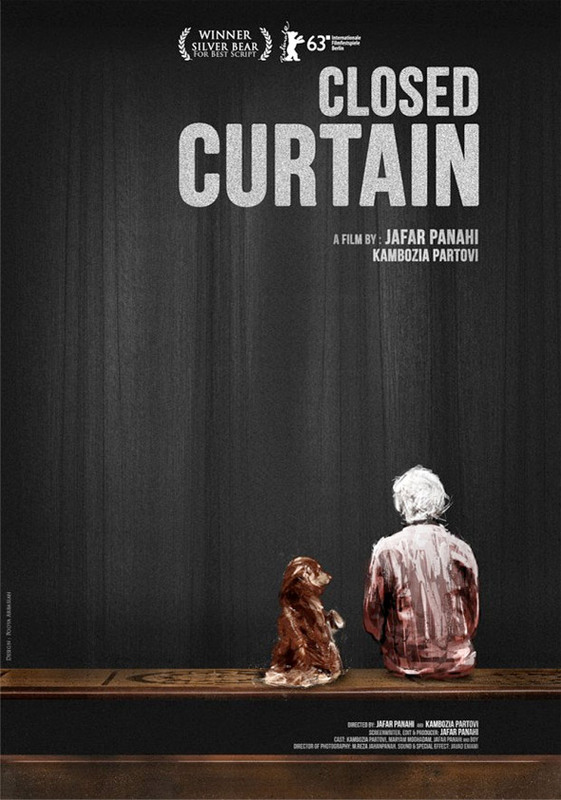 Above is the poster for Closed Curtain, co-directed by Jafar Panahi and Kambuzia Partovi. This premiered at the Berlin Film Festival and will arrive in select US theaters starting July this summer. Anyone curious? I wonder if the response for this film would/will have been the same if they didn't tell the audience he was banned from film making.